The M15 AllroundDual camera is a well equipped, professional network camera that is top of the Mobotix product range, both in terms of functionality and technological capability. 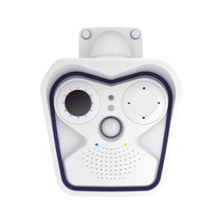 The modular design of the M15D system platform ensures maximum flexibility for the Mobotix thermographic camera. The M15 Thermal camera comes standard with a thermal image sensor and a dummy module (to remain weatherproof to IP66). In addition, it is possible to use any Mobotix sensor modules (5 MP, colour or black and white, telephoto to Hemispheric, with or without long-pass filter/LPF) in the M15 Thermal for identification. Camera software is then used to activate the dual image display on one of the two image sensors (thermal or standard) or both simultaneously. The thermal sensor is capable of detecting in complete darkness and/or through smoke, smog, or a thin plastic screen (limited during thick fog); applications include border protection: view of the sea in coastal areas, ships in the distance can be recognized in hazy conditions.